Well, my senior season has started. Last Saturday on a beautiful day (in Eagle River) I headed out to meet up with Kelsey Reeves and her mom and then we met up with Meaghan Byman and her family and headed out to Beluga Point on the Seward Highway. We had an idea of what we wanted to do, but once we got out of the cars at Beluga Point, things changed. Wind. A lot of wind. Windiest I have seen it on such a beautiful summer day. 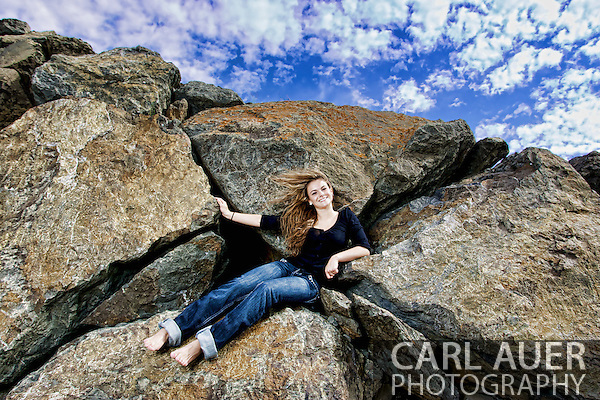 It was too windy to do any shooting on the rocks or on the railroad tracks. So, on to the second location. Back towards Anchorage a little, there is a park. Nice rocks in the background, little lake and waterfall bellow the parking lot. Lots of neat ideas to try here. Right away I got my favorite shot of Meaghan of the day. The rocks, the sky, the clouds. We shot a lot on and around these rocks. Meaghan was a riot too, holding a serious face for two pictures before busting out laughing. Another fun shot in about the same location but with Kelsey came out real nice too, but the clouds started rolling in a bit. After playing around on the rocks and laughing at the mom’s holding my light stand so it did not blow away, we headed down a little path about 25 to 30 feet below the parking lot to a little lake and waterfall. 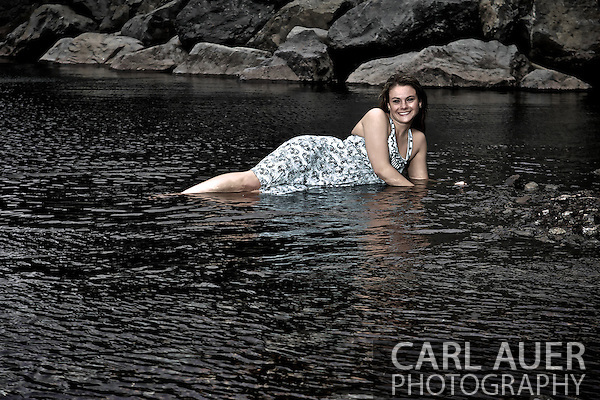 After shooting back by the waterfall for a while and gaining an audience of about 10 people up in the parking lot above, Meaghan wanted to get into the water….this is a rough edit of that shot. I have ideas for this. I was not happy that the heavy winds were sneaking down to the lake. It would have been much cooler if the water was glass smooth, but once I really dive into the editing of these shots, I have some ideas to play around with. This is kind of a Sin City style of editing. After we were done at this spot, we hopped back into the cars and headed to another location with a really cool tree and a waterfall on the side of the road. While it was a cool spot with a kind of Lord of the Rings feel to it, there were things falling around us. In fact, my background light, being held in the capable hands of Mr. Byman, was nailed on the reflector by a falling rock, and behind the girls a branch fell. Wondering if a goat was up on the hill knocking stuff down. After playing on the tree, we went on to the waterfall, and after doing the umbrella thing, Meaghan and Kelsey had to jump into it and get some cold wet photos taken..After about 300 photos between the two girls, we headed to We B’s for lunch and to start talking about sports photos next weekend to complete their senior packages. 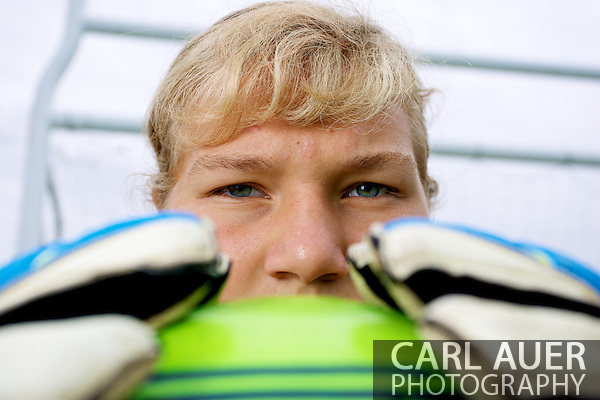 Thanks to both the Byman’s and Reeves families for a fun and interesting shoot. We will be doing more photos with these two on this Saturday, focusing on Meaghan with basketball and soccer, and Kelsey with soccer. Maybe a few more fun ones too. 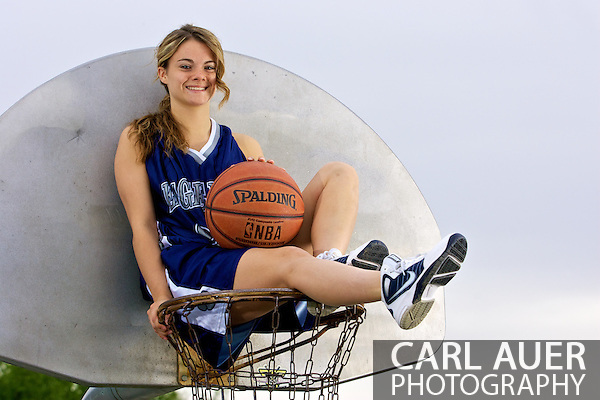 We headed out this last Saturday to complete the shoots of Meaghan and Kelsey with some sports shots. 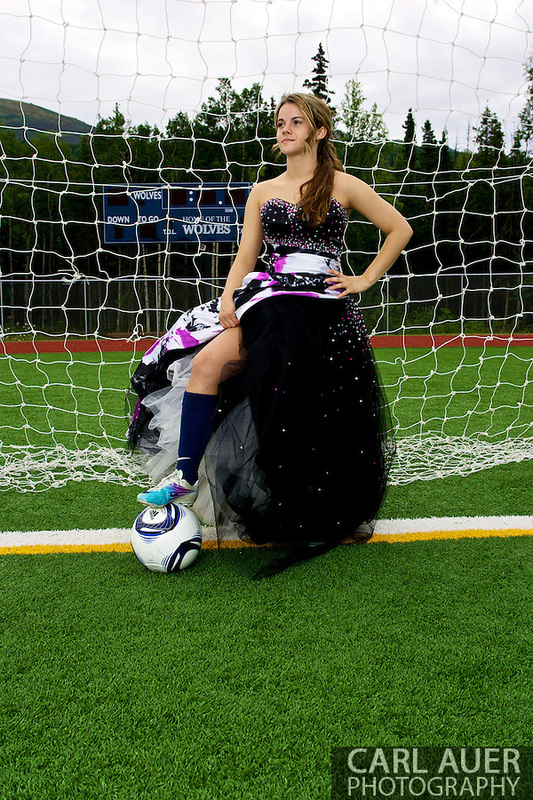 Meaghan, who plays both basketball and soccer, I had some fun ideas to play with. One we were able to do, and it turned out fun. I grabbed a ladder and met Meaghan and her family up at Lions Park. It was fun all around because the Chugiak Mustang football team was having a pancake feed, so having a ERHS Wolves uniform there was fun. After setting up my lights and everything before Meaghan got there it started to rain, which I was not excited about. I pulled down my lights and batter packs and put them in the car, then when it stopped raining, I pulled them all out again. Meaghan showed up and I got her to crawl up onto the basket, and we started taking pictures. 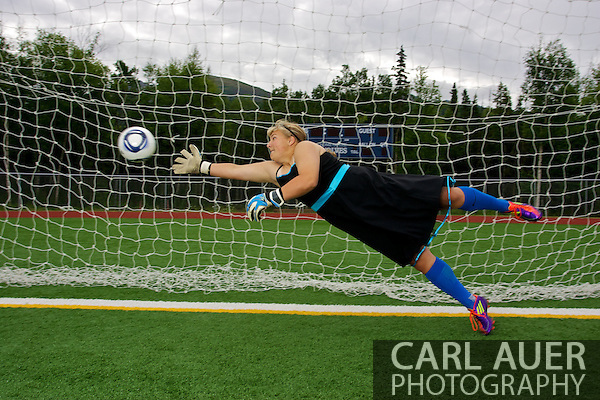 After playing around with this idea and a few others (Meaghan throwing down a monster dunk, standing inside the rim, etc), we packed up and headed to ERHS to do some soccer shots on the turf. We met up there with Kelsey, and got some fun shot. Then came out the prom dresses….. Please note, these are not the final images. Most of the photos have only been color corrected and sized for the web. Final edits of these photos will be updated later. 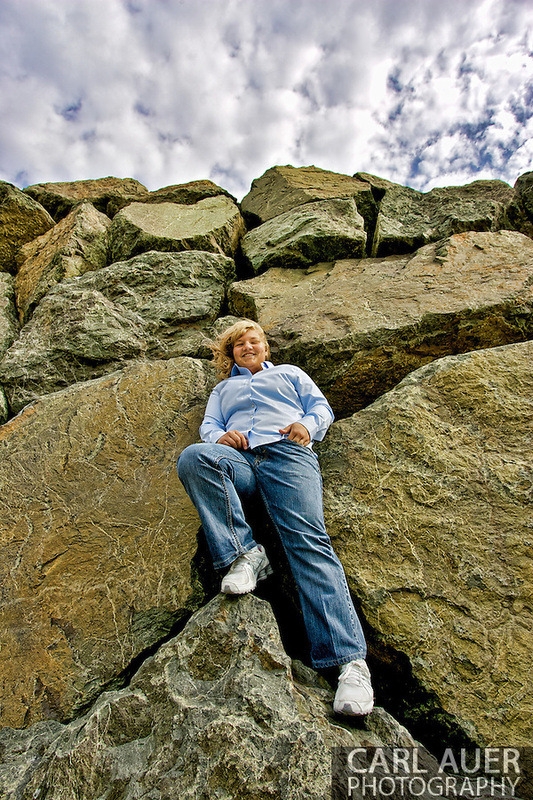 So after playing around with photos on the soccer field, we headed over to a rock by the entrance of the school and got some nice yearbook shots, and then headed for lunch. These were my first senior photos that have taken me from rocks, lakes and waterfalls, to basketball hoops and prom dress soccer fields. A lot of fun, new experiences, and ideas come from these sessions. 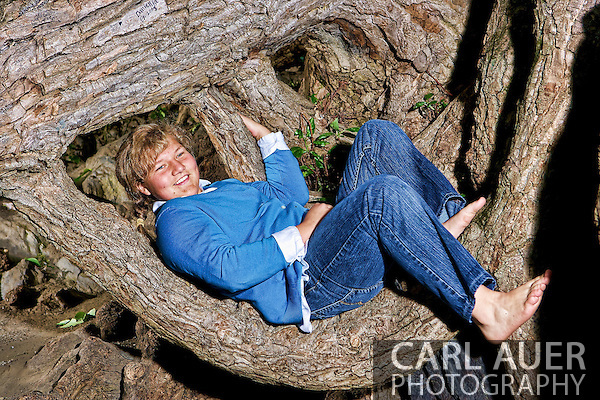 This entry was posted on Thursday, July 28th, 2011 at 9:19 pm	and is filed under Portraits. You can follow any responses to this entry through the RSS 2.0 feed.